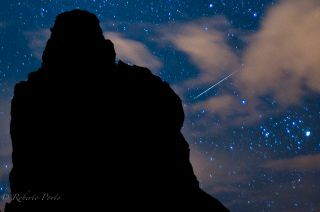 A Quadrantid meteor shower streaks across the night sky over Tenerife in Spain's Canary Islands in this 2012 photo captured by photographer Roberto Porto. The 2015 Quadrantid meteor shower will peak on Saturday, Jan. 3. Stargazers can start the New Year off with a bang this weekend as the first meteor shower of 2015 reaches its peak on Saturday night (Jan. 3). The first meteor display of the year will be the Quadrantid meteor shower. Meteor showers are usually named after the constellation in the sky where their radiant is located: the point in the sky from which they appear to radiate. Thus, the Perseids are named for Perseus and the Geminids are named for Gemini. The 2015 Quadrantid meteor shower will peak on Jan. 3 and appear to radiate from a point north of the "kite" formation of the constellation Boötes. A wall quadrant was a large instrument mounted on a wall used to measure angles in the sky before the invention of the telescope. Most famously, the 16th century astronomer Tycho Brahe used a large wall quadrant at his Danish observatory Uraniborg to measure accurate planetary positions, which Johannes Kepler later used to develop his three laws of planetary motion. In 1795, Lalande created a dim constellation between Boötes and Draco which he named Quadrans Muralis. But when the International Astronomical Union defined the present 88 constellations in 1922, the Quadrans Muralis didn't make the cut. Today the name survives only in this meteor shower. While the Quadrantid meteor shower can produce as many bright meteors during its peak as the more famous Perseids, the shower's actual peak time is much narrower, making the chances of seeing a Quadrantid much less than those of seeing a Perseid. So timing is everything. Past observations allow us to predict that the 2015 Quadrantid meteor shower will peak on the night of Jan. 3 at 9 p.m. EST (0200 GMT). During this time, the radiant will be close to the northern horizon and there is a good chance of seeing "Earth-grazers" — meteors coming in close to the horizon to the east and west. As the night progresses, the radiant will rise higher in the northeastern sky, so that more meteors should be visible over a larger swath of sky, mostly in the east. By the beginning of dawn, around 6 a.m., the radiant will be high in the eastern sky. However, by then the shower will be 9 hours past its peak, and the bulk of the meteors will be past. The best time to look for Quadrantids will be between midnight and 2 a.m. your local time. Remember to dress warmly, and watch the sky in the east, about half way up to the zenith. Besides timing, the other factor observers will contend with is the bright gibbous moon. The moon will be only one day shy of its full phase, and will be above the horizon all night long. Try to locate your observing position so that the moon is blocked by a building or tree, and avoid looking in its direction. You can try capturing Quadrantid meteors using any camera that allows time exposures. Again the moon will cause problems, fogging your images with its light. The trick will be to make long enough exposures to catch a meteor or two, while avoiding fogging with moonlight. As always, we welcome your images. Editor's note: If you snap a great picture of the 2015 Quadrantid meteor shower and would like to send it in to Space.com, let us know. We just might feature it in a photo gallery or story. Photos and comments can be sent in to managing editor Tariq Malik at: spacephotos@space.com. This article was provided to Space.com bySimulation Curriculum, the leader in space science curriculum solutions and the makers of Starry Nightand SkySafari. Follow Starry Night on Twitter @StarryNightEdu. Follow us @Spacedotcom, Facebook and Google+. Original article on Space.com.